Extend the lifetime of the beds and mattresses within your residential workplace with our Gompels Premium Underpad 60x90cm. 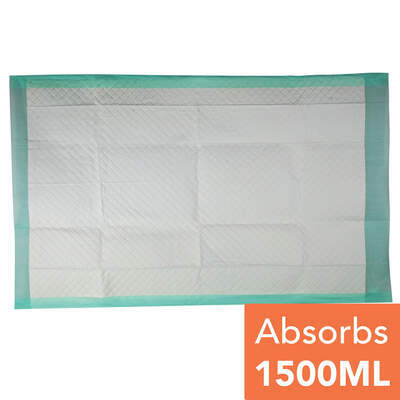 Offering a high-quality option for busy care homes and a suitability for high volume users, these compact underpads include a waterproof back sheet that prevents liquid from penetrating through. A pulp layer has been included to ensure quick absorption and dispersion throughout the entire underpad for the most comfortable and secure fit on every patient's bed. Each super soft premium underpad has been crafted for comfort with a higher level of absorbency for extra peace of mind. Folded edges contain liquid and unwanted leaks. Always striving to maintain the dignity of your residents, here at Gompels, we also offer the Sangenic Easiseal Maxi for the safe and hygienic disposal of used incontinence pads and nappies. For alternative options to help counteract incontinence, we have a range ofIncontinence Pads and Adult Nappies - at exceptional wholesale prices.